Skincare came late to me. As a spotty teen I did all of the wrong things; Didn’t regularly wash my face (urgh). When I did I’d use stringent, alcohol teaming cleansers stripping my skin of any natural, helpful oils. I’d scrub that heavy duty apricot exfoliator to shred my face… If the cleanser wasn’t enough punishment. Also moisturiser was evil and to never be used. THANKFULLY I’ve now moved on and had an appropriate skincare routine for a few years now. If you’re at a loss I can recommend the skincare guru Caroline Hirons Blog, Sali Hughes’ Book/Youtube Channel and Wayne Goss’ Youtube Channel for starters. I’ve discovered that I have an oily/dehydrated skin type. The good news is that having oily skin reduces the onset of wrinkles (YAY), the bad news is that after a weekend on the booze or going one night without cleansing my face I will get at least one spot staring at me in the bathroom mirror in the morning (BOO). Crepiness, wrinkles and sagging skin you say, where do I sign up?! To combat both of my issues I use a mixture of products that work for me. 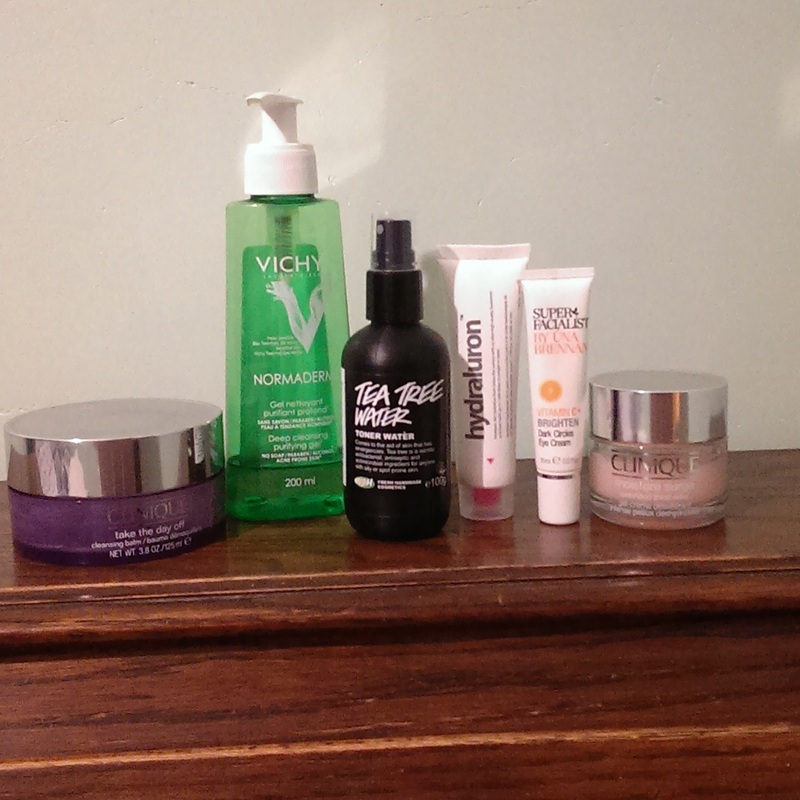 L-R – Cleanser, Toner, Serum, Eye Cream, Moisturiser. 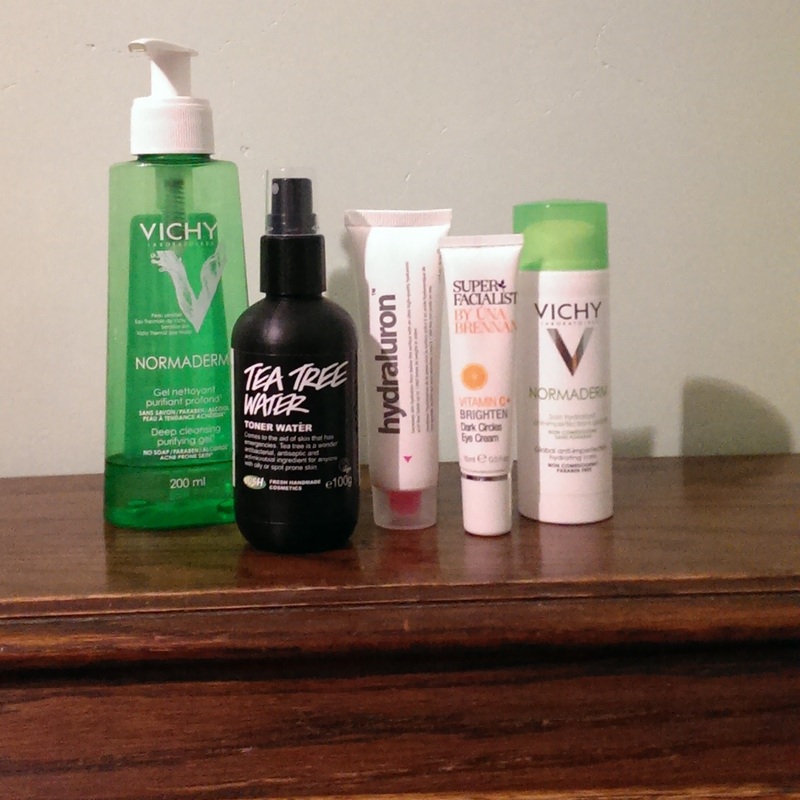 The cleanser I love is Vichy Normaderm Cleansing Gel, I’ve repurchased this several times. It’s soap and paraben free with lovely Salicylic acid and Glycolic acid. After washing and patting my face dry I’ll give it a couple of sprays of the Lush Tea Tree Water, it’s really refreshing and as tea tree is antibacterial it can help keep away the bacteria that can cause spots. Once this dries down I use a pea sized amount of the Indeed Labs Hydraluron which helps me solve my dehydration issue. The eye cream I’m using at the moment is Una Brennan Dark Circles Eye Cream, It’s not proven to reduce my dark circles (waahh) but it’s light, moisturising and I can apply make-up straight on top of it which *will* reduce them. Finally (depending on how my skin is that day) I’ll use my face moisturiser which on a normal day will be Vichy Normaderm Hydrating Care, this helps target both my oil and hydration issues. I know this seems a lot but it honestly takes 2 – 3mins on a morning. L-R – Make-up Remover, Cleanser, Toner, Serum, Eye Cream, Moisturiser. As per AM but with an added make-up removing step of Clinique Take The Day Off. It is a cleansing balm that I LOVE. It removes all traces of make-up including industrial strength mascara! It’s scent free and doesn’t sting my eyes. I then follow the AM routine with a change of moisturiser to Clinique Moisture Surge. It may look like pink ectoplasm but it’s really fantastic stuff, really hydrating without any stickiness and doesn’t break me out. 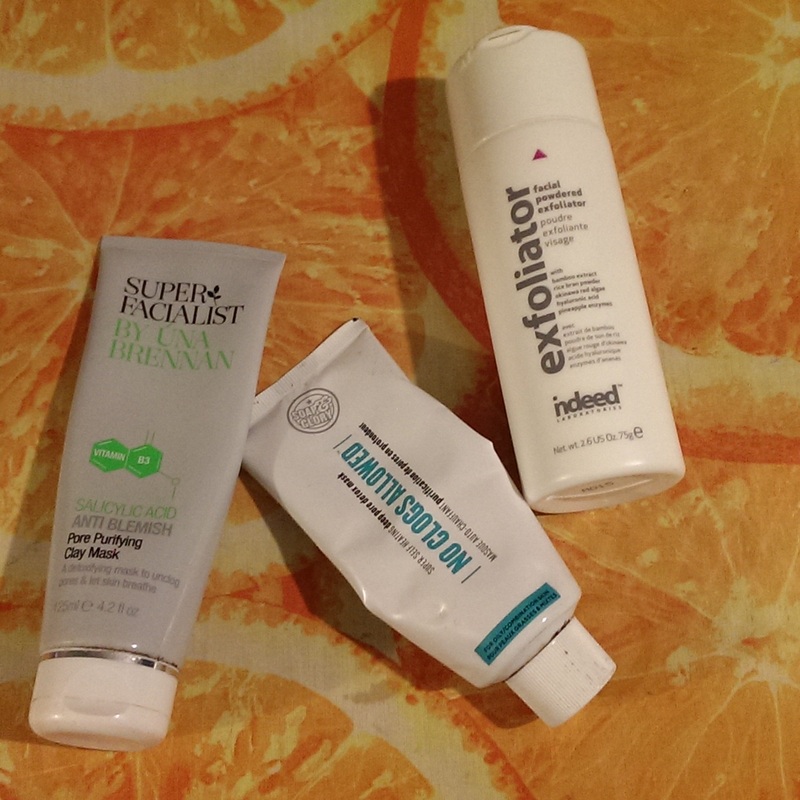 L-R – Facemask, Facemask, Acid Exfoliator. Once a week (usually Sunday to help combat the weekend indulgence) I’ll use one of the two masks, both clay based with Salicylic acid to extract impurities. Twice a week I’ll use the Indeed Labs Exfoliator which is a powder form, you mix with water to turn it into a foamy consistency. I’d use this PM after removing make-up and cleansing with the Vichy. To be brutally honest the first step and best step I’ve ever taken was too simply start washing my face and making sure I remove my make-up properly every day*. *Apart from 4am on a Sunday when a slapdash make-up wipe will just have to do.